They flock to you when you open the refrigerator door and beg you for scraps at the dinner table, but giving in to your pet’s pathetic pleas can actually do them more harm than you realize. As reported by MSNBC.com, there are several foods that the ASPCA’s Animal Poison Control Center informs you should never feed your animals. 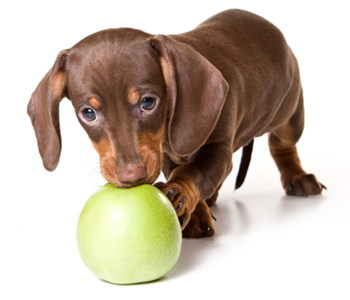 When it comes to your pet’s nutrition and health, it’s recommended to stay away from the following foods. We may love to indulge our sweet tooth, but giving your pet a bite of chocolate can actually kill him if eaten in large quantities. Dark and unsweetened baking chocolates are especially harmful and can also cause rapid or irregular heart-beats in your canine and feline friends. Giving animals products that contain caffeine can stimulate their central nervous and cardiac systems, which can lead to restlessness, heart palpitations and even death. It may be good for us to get our recommended daily allowance of fruit, but giving grapes and raisins to your dog can lead to kidney failure. If you think just giving him/her one every once in awhile will be okay, think again. As these fruits have cumulative effects, the toxins can build up over time and eventually kill your animal. Just like in humans, alcoholic beverages can cause liver and brain damage in your pets. Since our animals are smaller than us, the effects can be deadly, and even if given in small quantities, alcohol can cause vomiting and permanent damage. Beer and nuts may go hand in hand for us, but not so much for our furry companions. Especially toxic are walnuts and macadamia nuts, which can cause vomiting, paralysis and even death. The effects can be seen within twelve hours of ingesting these foods and can result in the inability to stand or walk, vomiting, hyperthermia, weakness and an elevated heart rate. Consisting of persin, which is toxic, this healthy fruit humans enjoy can cause heart, lung and various other tissue damage in dogs, cats and most other animals. Candy or anything with Xylitol (a common diet sweetener) can cause a drop in blood sugar, loss of coordination and seizures, which if left untreated can be fatal. Onions certainly add some flavor to many of our favorite dishes, but adding it to your pet’s food can destroy their red blood cells, lead to anemia and result in breathing difficulties. These effects are also cumulative over time. You’ve surely come home to find that your beloved pet has gotten into something they shouldn’t have, make sure your medicines are far enough out of their reach. Ingesting medicine prescribed for humans is the most common cause of pet poisoning. Carrots, green beans, cucumber and zucchini. Apples, oranges, bananas and watermelon (just watch out for the seeds). Plain cooked pasta and white rice. If you find that your pet has gotten a hold of anything you might think is toxic, call your local veterinarian or the ASPCA Animal Poison Control Center at (888) 426-4435. Keep these numbers handy, because no matter how many precautions you take, accidents can still happen.